S+ by ResMed is a sleep tracker that monitors your sleep without any mattress strips or wristbands and provides insightful data to improve your sleep. However, can it really help you sleep better? What technology is used to track your sleeping patterns? How accurate is the ResMed personal sleep monitor? We will dive into an in-depth review of this product, but if you are in a hurry, go to the bottom of this review to see why I don't recommend S+ anymore. The company behind the S+ focus on developing medical devices to deal with respiratory disorders like sleep apnea, chronic obstructive pulmonary disease. ResMed is founded in 1989, has over 600 employees, and have been monitoring patients with over 6 million cloud-connected devices. As a medical equipment company having long years of experience in sleep-related issues, ResMed took its first step into the consumer tracker market with a contact-less personal sleep monitor. The S+ by ResMed is first released in October 2014 as the first non-contact sleep tracker system to monitor and analyze sleep patterns. The strip-based sleep trackers like Beddit or Nokia Sleep are also contactless devices. You place them under your mattress, and it is not in direct contact with your body like wearables. In a way, we can say S+ is even more non-contact as you place it on a bedside table, it doesn't even need touch to your bed. You place the S+ unit on a bedside table to capture all the data about your sleep, room conditions like light, temperature and noise levels. The S+ package includes a white plastic pod, a tower like a brushed metal frame, power supply unit and a USB cable. The frame is a container for the pod, and the only sole purpose of this part is to help you in positioning the pod correctly. All magic happens within the pod itself. But you have to place the pod at the right height and angle towards your body while you are in bed. As long as you place the pod itself in the correct position, you don't need the frame. For example, if you travel a lot and want to reduce your luggage size, or just to keep things simple, you can put aside the frame, and use only the pod. 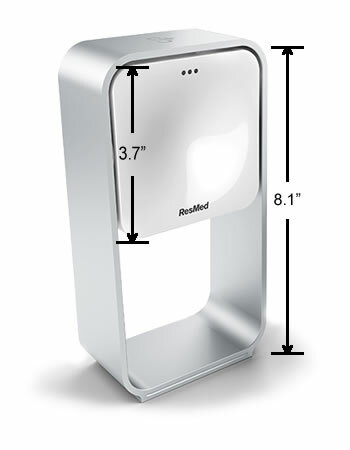 The S+ pod is a small cubic rectangle which is 3.7" length, 2" width, 3.7" height and weights about 3.4 ounces. It is about half of the frame in height. From an aesthetic point of view, both the pad and the frame might not look that impressive, but they may blend into the most room decors nicely. The power supply unit comes with an extra USB outlet, which makes your life a little bit easier and let you charge your smartphone while the S+ is on. The setup process is very straightforward, all you need to do is connect the USB cable to the pod and the USB power unit, plug the power supply into the wall outlet. The sleep tracker is almost ready for tracking your nights, of course, after positioning the pad at the right height and angle. The S+ is designed to detect your breathing rate while you are in bed. You can use the S+ with/without the Frame as long as you pay attention to the two key points below. The bottom of the pod should be higher than the top of your mattress, and the pod should be placed about an arm's length away or between 1.3 to 3.9 feet, facing to your chest. And you should not place any object between the pod and you. Even if you sleep with a partner who loves to move continuously throughout the night, the S+ can distinguish the between two, and measure only the one who is closer to the pad. However, it is not recommended using the S+ when you sleep with a pet since the pet can intervene between the pod and your body. S+ by ResMed app is available on both the Apple Store and Google Play Store. After installing the app, you go through a series of question about your lifestyle and sleeping habits. S+ use this personal data in making better and personalized recommendations for you. When you've completed the application set-up, you connect the S+ sleep tracker with your smartphone or tablet via Bluetooth. You need to keep Bluetooth on while using the S+. S+ continuously transfer the data it collects to your smartphone or tablet while you sleep. If it can't connect to any smart device during the night, it continues to track your sleep but send the data only when the connection is established again. If you want to track the sleep of you and your partner at the same time, unfortunately, that is not possible with S+ personal sleep solution. With other contactless trackers, like Beddit or Withings(Nokia) Sleep, you can set up two devices and pair them with two different phones and track both sleepers at the same time. At this point, you are ready to track your nights. Before you go to bed, you open the S+ app, answer a couple of questions, tap on the "Sleep" and begin your tracking journey. And when you wake up in the morning, tap on the "Stop Tracking" to end the tracking session. ResMed sleep tracker do not have an auto-on or off function. You tap the app button to start the tracking and to end the monitoring. The S+ Mentor, the analysis tool in S-Plus sleep monitor, provides you with a sleep score along with actionable bits of advice tailored to your needs. Recommendations could be small steps in your daily activities or bigger ones that you can take action in the longer term. 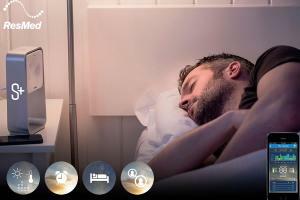 The app also has a "Relax to Sleep" feature, where a soothing sound is synchronized with your breathing. As your breathing slows, the sound reduces. Just breath slowly, follow the sound, fade into the sleep state easily. If you are into meditating or breathing exercises, you will probably have more fun with this feature. We go through several sleep stages every night while sleeping. Sleep Chart gives you the details of four phases; Wake, REM, light and deep sleep cycles. If your sleep is affected by any external conditions like temperature, light level or noise, the app shows those disturbances. Or if you wake up and leave the bed during the night, you will notice a gap on the Sleep Chart. ResMed watches your wake-up alarm time, and try to find the optimal time to wake you up in a light sleep phase gently. Waking up during a light sleep phase is a lot smoother, and this makes you feel more rested, energized, refreshed when you get out of bed. S+ by ResMed is a contactless system, and it tracks your breath rate and body movements without any gadgets touching your body. The ResMed borrows a technology from nature; a system called echolocation used by bats for navigation and hunting insects in the dark. Bats send out sound waves and listen for the returning echoes when these waves hit and bounce off of an object. S+ use ultra-low power radio waves to detect body movements. It sends out a short pulse of radio waves (at 10.5 GHz), and then look for the echo of the pulse. The ResMed have been testing the accuracy of this sensor system over the last ten years, and results have been published in scientific papers. Over 2 millions nights of sleep data have been analyzed to verify how S+ can be used to improve one's sleep quality. While checking out the product, I have noticed many customers are stating that the ResMed has shut down their servers for S+ and it is not possible to register the app anymore. I couldn't find any official discontinuation statement by ResMed on the internet. On official product site, mysplus.com, the retailers are removed from the page that lists the national stores. The ResMed had joint ventured with two partners, Dr Oz and Pegasus Capital Advisors in November 2017 and launched a new sleep tracker called SleepScore Max, as the "World’s Most Advanced Sleep Improvement System". The SleepScore Max is a rebranded version of S+. Its design and usage are very similar to S+ -this time a pod without a frame- and it uses the same technology that has been used in S+ with some improvements on the app side. I have contacted mysplus.com to ask if they continue to support the S+ and have received a response on the same day. They mentioned that there is some bug with S+ app due to recent changes on Android and Apple platforms, and they are working on fixing the issues and make it compatible with the latest updated OS. However, support also suggests that the S+ is being phased out and recommend to check out the SleepScore Max, which is a successor product for S+. The S+ was priced at $150 when the product was first launched, but you can buy it now for one-fifth of that price from bedbathandbeyond.com. The product is not currently available in bestbuy.com, but S+ is still available on Amazon. S+ is on clearance on bedbathandbeyond.com as of October 2018 costing only $30, which is an excellent bargain. S+ Sleep Monitor is not available at bedbathandbeyond.com anymore. However, since we are not sure if S+ will be still fully supported by ResMed, I would be hesitant to purchase this product for now. The S+ is a reliable, contactless sleep tracker by a company with many years of experience in sleep science. It is easy to set it up and use, and you don't need to wear anything on your wrist. The data accuracy is maybe the most critical factor when choosing an activity tracker, and the bio-motion sensors used to measure breath and body movements in S+ is tested and validated by 10 published clinical studies. However, I recommend to check out the new re-branded version of this sleep tracker, SleepScore Max as it seems the S+ will not be on the shelves for long.